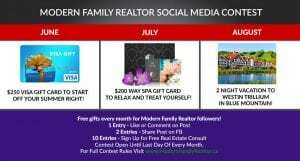 Recently we selected Natalia and Brett as the June contest winners for the Modern Family Realtor social media campaign! They took home a $250 Visa gift card. Thank you to all of the 300+ entrants! It was amazing to see such a great turnout. Keep your eyes out for the June and August contests as the same rules apply! 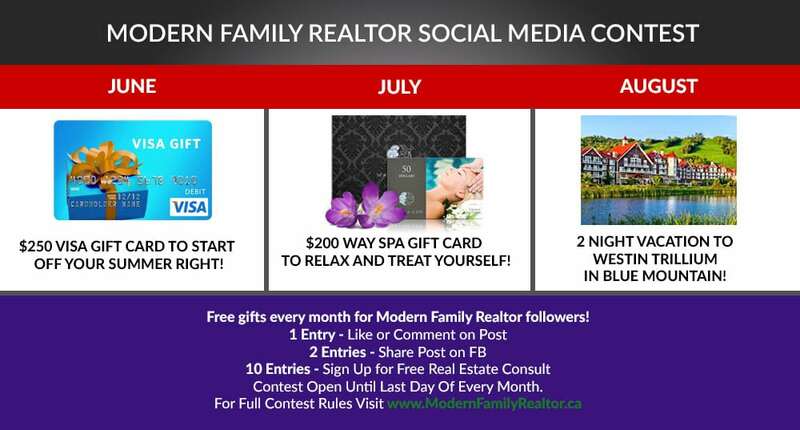 We will be giving away a Spa gift card as well as a vacation to our vacation property in Blue Mountain! We announced the winners for the July contest on Facebook Live, so for any of you that entered the FIFA contest, please tune in to find out the winner of the contest once the World Cup concludes! -1 Entry for Liking or Commenting on the Post! -2 Entries for Sharing the Post on Facebook! Winner will be announced on Facebook and Instagram on the last day of each month1! Must be a resident of Ontario and 19 years old to enter.